GENEVA — When Greg Woodworth and his wife, Kelly, brought an online cookie- maker to the Technology Farm on Pre-Emption Road 12 years ago, they did so because of the region’s high-quality agricultural products. The Stony Brook Cookie Co. idea soon crumbled — not so much because the Woodworths weren’t selling many of them, but because they saw opportunity in another food concept: creating culinary oils from seeds that would otherwise have been sent into the waste stream. Fast-forward more a decade later, and the seed is still the basis for all Stony Brook Wholehearted Foods products. The effort has garnered critical praise, growing sales and new products. Its Butternut Squash Oil recently won Silver in the Specialty Food Association product awards for 2018. It was selected by a panel of judges that included chefs, culinary instructors, recipe developers, food writers, and specialty-food buyers with expertise in particular categories — in short, people who know food. “We were not just up against our region, but around the world,” Greg Woodworth said. 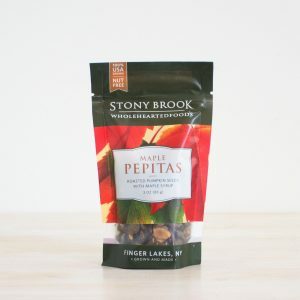 Stony Brook’s product lineup has expanded from culinary oils into healthy snacks and seed protein powders. As for those seed snacks, the company has a heavyweight grocer in its corner. Wegmans, whose footprint continues to grow along the East Coast, is selling the company’s seed snacks at its 97 stores. As for how seeds became the backbone of its business model, Woodworth said he has worked in partnership with the experts at the Cornell Food Venture Center on the campus of Cornell AgriTech, formerly known as the New York State Agricultural Experiment Station. However, it took time to develop the concept into a marketable product, Woodworth noted. “For us, it was like, ‘How do you get oil from butternut squash seeds?’ ” he said. With plenty of help from Cornell, they figured it out, forging a business partnership with Martin Farms that has grown from a small number of seeds for experiment into 20 tons annually. They’ve also moved beyond those squash seeds and into pumpkin seeds as well, Woodworth said. “It certainly has grown,” Woodworth confirmed. Retailer F. Oliver’s sells the company’s butternut squash oil under its own label at its stores in Canandaigua, Rochester and Ithaca. They have about 20 similar customers, he said. The butternut squash oil, said Woodworth, has a “pleasant, warm nutty, butter flavor” with a high smoke point, meaning cooks can safely heat the oil to a maximum of 425 degrees. It’s versatile enough to use with dishes from breakfast — everything from oatmeal to yogurt — to dinner, when it can be used in cooking or in a vinaigrette. Woodworth said one of the product’s fans is chef Christopher Bates of FLX Table on Linden Street in Geneva. It has the same flavor profile as the more expensive Japanese sesame oil, he noted. While the oil business is somewhat mature, Woodworth sees great potential in seed snacks. “Beverages and snacks are the big movers” for food retailers, he said. He said Wegmans loved the pumpkin seed product, especially because the seeds are grown locally at Martin Farms — not in China, the source of about 95 percent of the pumpkin seeds produced for snacking in the U.S. Unlike most pumpkin seed snacks, these seeds don’t have a hard shell; rather, there is just a thin membrane. Woodworth said the “goal is to grow” Stony Brook, and that he expects they’ll need to add another shift of workers at some point if the company’s snack lineup sales continue to accelerate. “We’ve been able to more than double our operating footprint” at the Tech Farm, he said. Any additional growth at Stony Brook will be done methodically, Woodworth stressed. “We don’t want to over-leverage in labor and equipment,” he said, explaining that many promising companies fail because they try to expand too fast. Johnson said Stony Brook Wholehearted Foods is a “classic example of what we like to see,” meaning they worked in collaboration with local farmers and Cornell researchers to develop unique products that turned the company from start-up status into an established business. He said tart cherry juice manufacturer Cheribundi provides the template. They started and grew at the Tech Farm, eventually getting their own space at the former Tops Friendly Markets in the Lake Geneva Plaza on Routes 5&20. Johnson called Stony Brook a great tenant at the Tech Farm, and praised its owners as great citizens.